I think I’ve seen The Horse Whisperer although I don’t remember a lot., Might not be bad as a rewatch actually. I saw the movie years ago when it came out. Have a great week! Good luck with your book tour website, Cindy. I highly recommend Lab Girl. It’s a delight of a book. Good to know. By the way, your message went to my spam folder for some reason. Glad I checked. 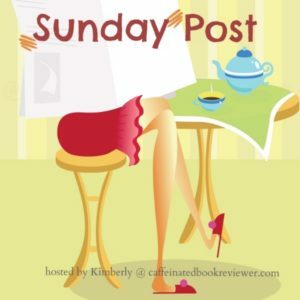 Welcome back to Sunday Post. I saw The Horse Whisperer movie…but haven’t read the book. I used to have so many bookshelves that I literally stumbled over them (especially the three in my hallway). I purged my shelves a couple of years ago…actually there were a series of purges, and several empty shelves went to my daughter’s house. I still have two empty shelves in the garage…almost as if I sense that my book numbers will grow again. Now I have two shelves in my bedroom, one in my office, two big ones in the living room…and a few cupboards that have books and trinkets in them (in the dining room). Enjoy the books and the overflowing shelves…even after my purges, I remember those days fondly. I was considering switching more to e-books, but seems like it would be even easier to get way too many books in a short time. I’ve been curious about the Orphan Master’s Son, and yes I did read the Horse Whisper. I use to devour all of his books…now I just watch the movies as my hubby will view them with me..LOL Have a fantastic week! I’m still in the first part and I can tell The Orphan Master’s Son is one of those books English majors write long theses about. It has enormous depth. I remember when the movie came out but I never saw it and didn’t realize it was based on a book. Sounds interesting! Great job on the spring cleaning! Spring cleaning is one of those things I love the idea of but very seldom actually do. Maybe this spring? Have a great week! Spring cleaning? You are finding time to do that? Or rather, making time? I’m afraid that is going to get skipped this spring. I have 2 large bookcases and 2 small bookcases, and that’s not counting another small one just for cookbooks and another large one for all of hubby’s computer manuals. I purged books big-time before each cross-country move. And also recycle them through PaperbackSwap and use the local library a lot more than I used to. Biggest book space savings? My Kindle. Yes, it’s easy to pile on a lot of books there, but somehow they don’t take up as much house space! Nor do they accumulate dust. It’s a win! Sounds like you have been busy! I wouldn’t post anything if I didn’t prepare posts ahead of time, I’m afraid. I used to be able to write blog posts last minute, but not for awhile now. I’ve never read The Horse Whisperer, although I know it’s gotten a lot of praise. I hope you and Karen are enjoying it. I haven’t seen the movie either.